Yes, we really are Number 1! Welcome to the website for Girl Scout Service Unit 1 -- located in sunny Palo Alto, California! We hope our website will assist you in learning about the Girl Scout program and our Palo Alto Service Unit in particular. We are Service Unit 1 because Palo Alto was the very first Girl Scout location on the West Coast of the United States. Go on to the History tab to learn more. Girls in the Palo Alto area who would like to become scouts should look at the Join Us tab up there on the far right. But the Service Unit for the City of Palo Alto is now officially Service Unit 601 because it is also one of 19 service units in the Santa Clara County Area, which are part of Girl Scouts of Northern California. Our troops are made up of girls from the Palo Alto Unified School District as well as several private schools. Go on to the Location tab to learn more. The Service Unit provides support and acts in an advisory role for girls and leaders, and it organizes activities throughout the year. Our leader meetings are held on selected Monday evenings from August through May at the Lou Henry Hoover Girl Scout House . (This page has a tab about our home, too.) This is the time when information from the Northern California Council and National organization is brought to the leaders, and when leaders can find out about upcoming events and exchange ideas with other leaders and service team members. In 1922, Service Unit 1 was established as the first Girl Scout Council on the West Coast. Lou Henry Hoover, the wife of President Herbert Hoover, had been active in Girl Scouts on the East Coast and was the president of the National Council of Girl Scouts. She grew up in California, went to San Jose State University (then known as the San Jose Normal School) and then studied geology at Stanford University, where she met her husband. She met Juliette Gordon Low, who founded the Girl Scouts of America, at the end of World War I. When her husband moved the family to Washington D.C., Hoover started her own troop of scouts, which included both white and African American girls — a rare occurence at that time. Her historical files reveal that she was committed to the changing roles of women and girls and the opportunities the movement provides. This desire to provide expanded opportunities for young women everywhere led her to establish the Girl Scout movement in the western part of the United States — starting in Palo Alto. After her husband's presidency concluded, Hoover's family moved back to California, and she brought the Girl Scouts with her. In later years, as she continued in her devotion to scouting, she went on to serve as President of Girl Scouts USA. 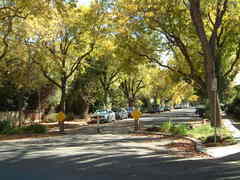 Palo Alto is a beautiful town located on the Pennisula about half way between San Francisco and San Jose, California. It is a community of approximately 61,200 residents. Part of the San Francisco Metropolitan Bay Area and the Silicon Valley, Palo Alto is located within Santa Clara County and borders San Mateo County. More than 100 years old, Palo Alto is named for a majestic 250 year old coastal redwood tree along San Francisquito Creek, where early Spanish explorers settled. Although it is famous as the birthplace of Silicon Valley's technology businesses, nearly one third of Palo Alto's 26 square miles remains open space. Palo Alto prides itself on protecting open space and parkland, and has more than 30 City-owned parks. Stanford University contributes a great many cultural and educational offerings to Palo Alto, a world-class medical facility, and an upscale shopping mall that is a tourist destination in itself. The City of Palo Alto granted a piece of land for a Girl Scout House to be built within a corner of Rinconada Park adjacent to what is now the Junior Museum and Lucie Stern Center. Lou Henry Hoover and two other members of the Palo Alto Girl Scout Board each donated $500 to build the meetinghouse. Stonemasons built the fireplace from the sandstone of the fallen arch over Stanford’s Palm Drive that had been destroyed in the great 1906 San Francisco earthquake. Building the house became a community affair where local builders, architects, painters, and many others gave their time and their money to complete the project. June of 1926 saw the house dedicated to the Girl Scouts of Palo Alto by Lou Henry Hoover. A display case in the entry hall contains memorabilia of Lou Henry Hoover, including some of her field notebooks and early photographs. It was researched and donated as a Silver Award project by a Palo Alto troop. Today, the Lou Henry Hoover Girl Scout House is the oldest scout meeting house remaining in continuous use in the United States. The building named after Lou Henry Hoover proudly carries on as meeting center for not only Girl Scouts of Palo Alto but for the entire Santa Clara Council. ...and where a girl returns those gifts by making the world a better place! Girl Scouting in the United States of America is part of WAGGGS (the World Association of Girl Guides and Girl Scouts). Troops exist because of parents. Parents can be leaders, drivers, treasurers, field trip chaperones, arts and craft specialists, camping gurus, communications coordinators, keepers of the troop scrapbook, career experts, or anything you can imagine. Each one plays a vital role in making the Girl Scout experience exciting, fun, and educational for your daughters. Volunteer to help your troop leader or become a leader yourself. Register as an Adult Girl Scout Volunteer - yes, Dads can become Adult Girl Scouts too. Complete the Volunteer Application and background screening. The untold secret is that Girl Scouts is fun for parents too. Your daughter will be excited when she finds out that you are willing to make time to participate with her. If you become a leader, you will be a hero to a whole gaggle of giggling girls. If you supply the enthusiasm, the Girl Scouts of Northern California will supply the training to help you succeed in bringing the GS program to the girls. Any adult who is likely to be alone with several of the girls (driving a field trip, cooking for a badge requirement, etc.) or handling troop money (manning a cookie sales site, etc.) needs to have completed adult volunteer screening as part of their registration process. Join the fun. Be a Girl Scout volunteer! Girls who would like to join the Girl Scouts in Palo Alto can start by filling out our online Membership Interest Form. Get your parent/guardian's permission first. Tell us enough about yourself so that we can match you up with a troop. Leave a phone number and/or an email address so we can let you know how that is going. If you know a specific troop that you would like to join, write a note explaining that in the comments field. We also hold a number of Registration Events each fall at individual schools and at the Scout House. Check the What's Happening area of this Web site in August and September for dates and details.